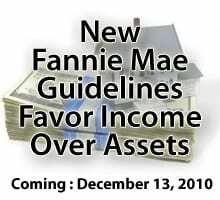 Fannie Mae has changed its mortgage guidelines. Home buyers and would-be refinancers are finding it tougher to get conforming-mortgage approved. Click here for a free Fannie Mae mortgage rate quote (Apr 24th, 2019). Conforming mortgages are loans that, literally, conform to the lending standards set forth by Fannie Mae and Freddie Mac. Often called “guidelines”, the standards are the series of checklists that stand between a mortgage applicant, and his loan approval. Conforming mortgage guidelines include things like maximum loan-to-value limits, and minimum credit score requirements, and they tend to change over time. The Winter 2011 changes, however, were “mainstream”. They affect everyone. The Winter 2011 guidelines affected 9 separate areas of the mortgage approval process. They run the gamut from income and assets to documentation and reporting. Borrower “minimum contributions” are eliminated for 1-unit purchases with at least 3% down. Gifts and grants are permissible sources for a downpayment. All revolving debt must be included in debt-to-income ratios, regardless of whether there’s “10 Payments Or Less”. If there’s debt, it must be counted. A 5% monthly payment against the balance must be assumed when no minimum monthly payment can be verified via the creditor, or the credit bureaus. Furthermore, the new guidelines contain a note that former homeowners with a foreclosure on record must wait 7 years before re-applying for a conforming mortgage. Click here for a post-Foreclosure mortgage rate quote (Apr 24th, 2019). Do You Still Qualify? Get A Free Rate Quote And Find Out. Fannie’s new guidelines favor personal income over personal assets; it’s not what you have, it’s what you earn. Some people will be helped; others will be harmed. Self-employed persons and those with “good accountants” are especially susceptible.